An interview conducted with two members of St Louis libertarian group, Autonomy Alliance. While in St. Louis, I was lucky enough to stay with two members of the Autonomy Alliance. In that time, I’ve been impressed with the level activity I’ve seen from the group—regular publications, public events (not the least of which included a screening of the 1971 film Sacco and Vanzetti), and running a once-yearly weekend school. Unlike many of the city-based libertarian groups in the US, I hadn’t heard of them before. So I thought it’d be worth learning a bit more about them. The following interview took place with those same two members, although it’s in personal capacity, so should not be taken as the official AA positions. Tell me a bit about the group. When were you founded? How many people are currently active? Are members active in any other organizations? What are the particular politics of your group and what level of political agreement do you strive for? What are the activities and projects you’re involved in? Autonomy Alliance has been active for about 5 years, although it’s current core group has only been active since late 2008. There are about 10 members who attend regular meetings, vote on event proposals, and facilitate annual events. Our members are all involved with other local and national anti-capitalist organizations. AA is made up of PARECONists, social anarchists, radical feminists, and Wobblies. The goal has always been to bring together folks of different radical left-wing backgrounds into a cohesive organization to work on local projects, distribute literature, discuss readings and put out a quarterly newsletter. One aspect of AA that differs from many radical groups is that we have defined membership, a democratic voting procedure, and agreed upon organizational by-laws which we collectively edit every year or so. While AA is still small in numbers, I think we’re able to focus our time and energy into local projects in a way that’s relatively efficient. I think we all want to avoid the pitfalls that come along with doing things in a disjointed and loosely organized way. We co-sponsor an annual event called Left Wing School, a day long series of workshops and panel discussions on a wide ranging number of subjects, from labor, environmentalism, feminism, Palestine solidarity, etc. The LWS has occurred every December for the past several years. In the past, we’ve also co-sponsored several commemorations of the 1877 General Strike. In 2010, we brought in famous labor historian, Jeremy Brecher, along with popular singer-songwriter David Rovics to participate in this event. It was attended by about 100 people. Read the whole thing? or turn on Good Morning, America? You make the call. How about a little Economics? How about a discussion of our economic situation? The verdict will be announced on the 28th in Haifa. On Wednesday, Aug 29th, we will have a video conference call with Craig and Cindy Corrie at Traditions Cafe at 6:30 pm. I hope that many of you will be able to join us at Traditions next Wednesday to support Craig and Cindy and to pay your respects to Rachel. Posted in News and Updates, Trial, Trial Press Releases on August 21, 2012 by trial. 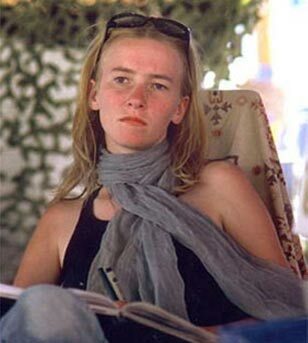 (Haifa, Israel – August 21, 2012) – The verdict in the civil lawsuit against the State of Israel for the killing of peace activist Rachel Corrie over nine years ago will be announced August 28, 2012, at 9:00 a.m. at the Haifa District Court. Rachel Corrie, a 23-year-old American from Olympia, Washington, was crushed to death March 16, 2003, by an Israeli military Caterpillar D9-R bulldozer while nonviolently protesting demolition of Palestinian civilian homes in Rafah, Gaza. The lawsuit, filed in 2005 on behalf of the Corrie family by attorney Hussein abu Hussein, charges the State of Israel with responsibility for Rachel’s killing and failure to conduct a full and credible investigation in the case. Austin Kelly sent along this link. It is readily apparent to any working-class person that the economic oppressions of capitalist society, numerous though they may be, are only one facet of the system of social control exercised by bourgeois society. The dominant culture is one of homogenous individualism, materialism, and intellectual vapidity. It is not a culture natural to a free and free-thinking people; but rather a culture designed to maintain the integrity of an unjust social order, designed to favor an exploiting class over a mass of oppressed working people – using each and every tool, political and ideological, that it can exploit in its battle for continued dominance. Oh yeah, a republican congressman said something stupid about birth control and a lot of the media thought that was news. It may be an entertaining story and it’s always fun to see a politician twist in the wind, but I don’t think it’s news that right-wingers are ignorant on topics of science, biology, conception etc. It is kind of ironic that this particular ignorant republican congressman sits on the House Science, Space and Technology Committee. But hey, he sits there, drawing a salary, nobody claims he brings anything to the table. What’s so grand about a grand jury? How about a little Michael Parenti debating Christopher Hitchens? I know that many of us will miss Christopher Hitchens. Here is a debate between Christopher Hitchens and Michael Parenti. A couple of great minds, quick thinkers, people who could think on their feet. Enjoy!